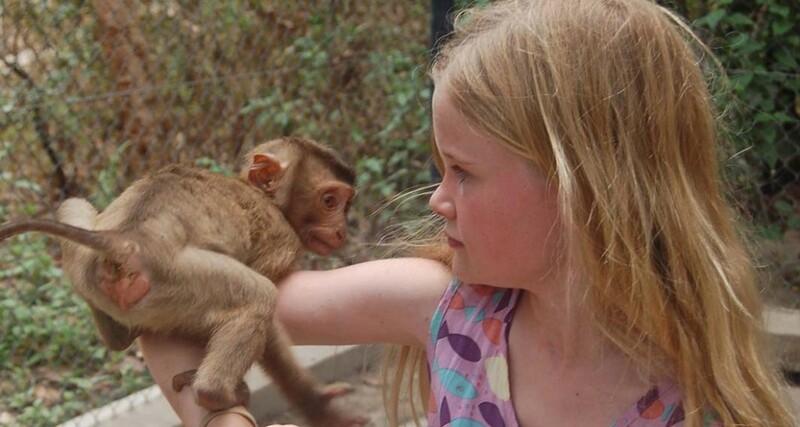 Brian Thacker Travel Writer | Monkeying around in Phnom Penh. We’ve just got home from our Big Dad and Daughter Adventure (with my 12-year old daughter Jasmine) to Cambodia and the highlight of our trip was a behind the scenes tour of the Phnom Tamao Wildlife Rescue Center. The wildlife sanctuary, which is about an hour out of Phnom Penh, is home to gibbons, sun bears, crocodiles, elephants, tigers, otters, deer and over a thousand other exotic critters. The animals were taken from poachers, markets, restaurants and abusive owners and they receive care and shelter as part of a sustainable breeding program. No animal in need is ever turned away, and wherever possible the animals are released back into the wild once they have recovered. On the way to the zoo we stopped at a local market to buy some fruit (to feed some of the animals) and when we arrived in the park one critter couldn’t get to our car quick enough. Jasmine just about fell over when she got out the car, though, because neither of us had noticed that an elephant had sauntered up from behind us and was almost standing on our toes. After introducing ourselves to Lucky she put her trunk right up into my face and I was told to blow down into it so she knew my smell. Jasmine was still quite tentative, however, and kept her distance. We left Lucky and drove further into the park and went to visit an elephant who hadn’t been so lucky. Chhouk (meaning ‘lotus flower’) is a young male Asian elephant with an incredible story of survival. The poor fellow was less than a year old when he was found alone in the forest with the bottom part of his right front leg missing, most likely caused by a poacher’s snare. Wildlife Alliance spent two weeks in the jungle treating Chhouk’s injury before he was stable enough to make the 26-hour journey to Phnom Tamao. To prevent his missing foot from causing pain and spinal and bone damage, the team at Phnom Tamao worked with the Cambodian School of Prosthetics and Orthotics to build Chhouk a prosthetic leg. Twice a day the ‘sock’ covering his stump is replaced and Chhouk follows a series of verbal commands (with the help of a huge bunch of bananas for reward) to get his leg in position to take off and put back on the prosthetic leg. Chhouk’s prosthetic leg comes with tyre-treads! Tigers were next – although I was slightly worried when Vuth our guide told us that we were going ‘into the pens’. But he just meant we were going into the area next to the pens where only staff members could go. There were seven of these majestic – and rather sleepy – creatures that were all rescued by the Wildlife Alliance and the Wildlife Rapid Rescue Team. The Wildlife Rapid Rescue Team has rescued more than 50,000 live animals since it was formed in 2001. …and even closer to this one. Next it was back to see our friend Lucky who had a rather exciting treat in store for us. We basically became a human canvas for an elephant that loves to paint. Donning a plain white T-shirt we simply stood there while Lucky proceeded to pick up a paintbrush and started painting – even changing colours a few times!. Lucky wasn’t quite used to humans of a shorter stature (I’m talking about Jasmine, not me! ), so Jasmine did get a bit of a face paint as well. Lucky, who has been trained through rewards-based positive reinforcement, responds to 20 different words (in English and Khmer) and, as well as painting, can dance. By the time Lucky had finished painting, Jasmine was hugging her trunk and hand-feeding chunks of watermelon right into her mouth. After a deliciously huge lunch of local food our tour continued with a visit to a sloth of slothenly bears, a family of cheeky otters and Jasmine’s highlight of the trip – getting thrown into a cage of baby monkeys. As soon as we stepped into the enclosure the four excited junior primates jumped on us. And swung from us. And crawled down the insides of our T-shirts. One even tried to get up into Jasmine’s shorts. Admittedly we did have food for them, which would help explain how excited they were, but even when all the food had gone they continued to use us as their own personal play equipment. Mind you, one was still a bit hungry when he pulled out one of Jasmine’s earrings and put it in his mouth. Our guide then casually forced open his mouth and pulled it out, gave a wipe and gave it back to Jasmine. Our deliciously large and largely delicious lunch! On final adventure was a walk in the forest with Lucky – or more like Lucky took us for a walk as she strolled off the track to tear up tree roots for a nibble. By the time we got back to the car we were hot, dusty and we couldn’t have been happier. This had been one of my greatest travel experiences, and not only did we have an amazing and memorable time, but were, in our little way, helping out. For a minimum donation of $150 per person all of the tour profits go directly back into running the centre and help supplement the generous donations from sponsors, the government and individuals allowing them to continue their great work and help save and educate people on Cambodian wildlife. Travel highlights of 2013. My best (and worst) bike rides.